So you want to win my Awards? *NO POP ups on the Sites. *Sites that I can't get out of. *NO hateful sites about Obi-wan/Star Wars & ect. Simply Amazing Award- This award is given out so often because this so easy to win. 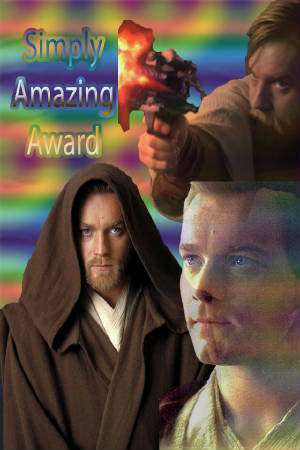 Your site has be Star wars related or actor related site. Your site has be cool and nice. All you got to do is fill out the form and I'll checik out your site and I'll give you the award. THAT'S IT! Easy? 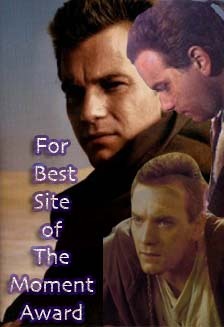 Site of The Moment of YES's: For Star Wars/related actor sites with great graphics, content, and a dedicated webmaster. Frequent updates are a must, even when there is no news, there’s still stuff to do. Given out about once every couple of months. Sorry, fanlistings and web groups not eligible. You CAN'T apply more then once because I will get too many emails for people applying more then once. Please give me time to look at your site. I'll email if you won or not.